In May 2009 I imported my new boy from Sweden to Austria. His name is Quixote - he is a Seal Lynx Bicolour. His nickname is Wickie, he has come from the "Land of the Vikings". We got his first babies in June 2010. 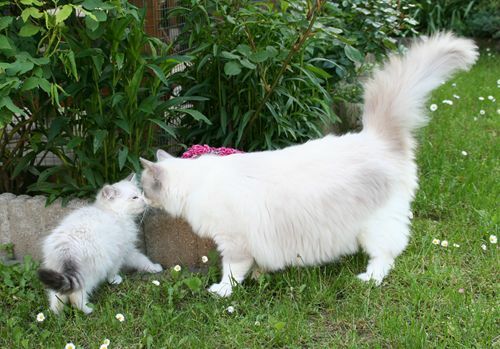 In July 2010 I went to Sweden again to pick up my new Lilac Lynx Mitted girl. Let me introduce you to RagGorgeous Little Lottie in "Breeding Cats". We live in Austria, in St. Florian near Linz (Upper Austria). Our kittens from previous litters have finally found new homes.See photos of our babies and more info: "Babies". See my new boy and new girls at "Breeding Cats". hearing / reading from you.